Hard to copy and paste. Hard to resize the window. Hard to open another window (no menu options do this). Seems to always start in C:\Windows\System32, which is super useless. Weird scrolling. Sometimes it scrolls down really far into blank space, and you have to scroll up to where the window is actually populated. I love Cygwin, but the problem with Cygwin is that it runs different executables. 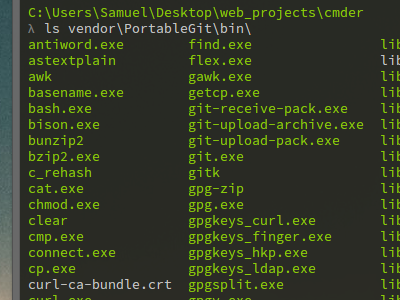 The Cygwin Python is different than the Windows Python, they are linked against different libraries and stuff. 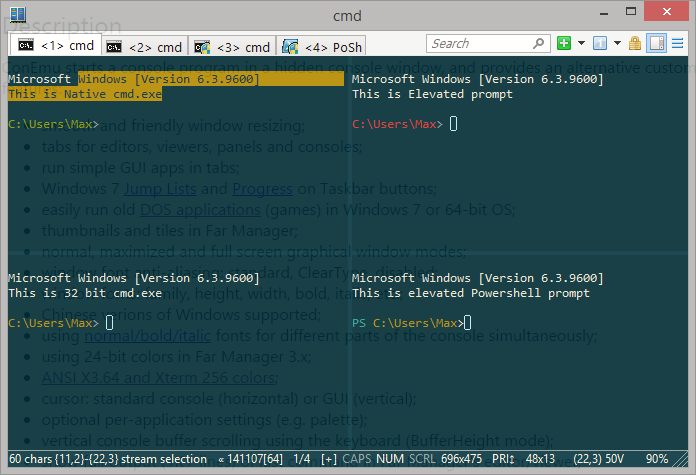 I am a fan of Cmder, a package including clink, conemu, msysgit, and some cosmetic enhancements. Not true. 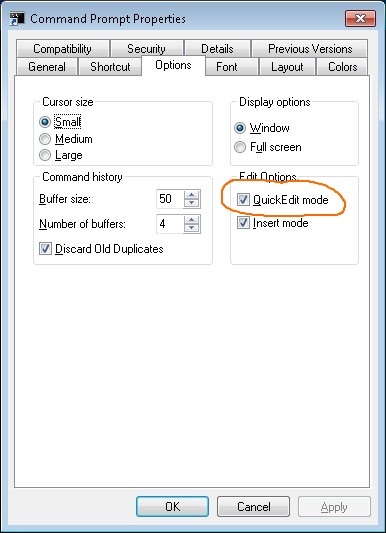 Enable QuickEdit, either in the properties of the shortcut, or in the properties of the CMD window (right-click on the title bar), and you can mark text directly. Right-click copies marked text into the clipboard. When no text is marked, a right-click pastes text from the clipboard. True. Console2 (see below) does not have this limitation. 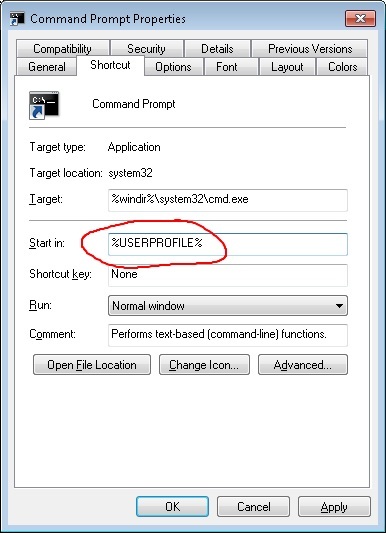 or by modifying the AutoRun registry value. 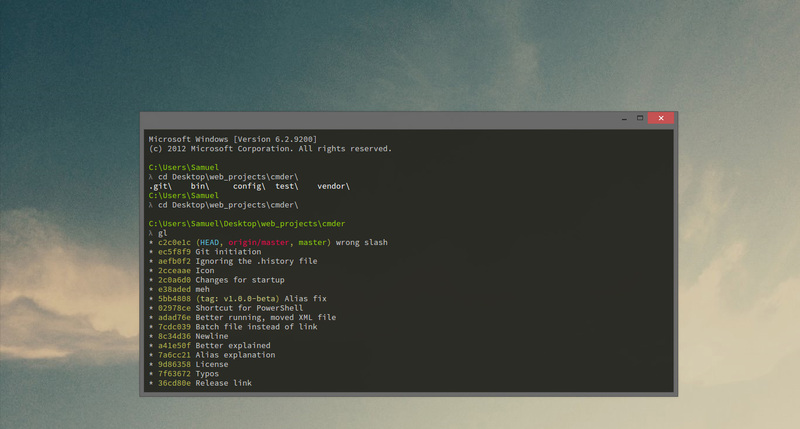 Shift-right-click on a folder allows you to launch a command prompt in that folder. An alternative to plain CMD is Console2, which uses CMD under the hood, but provides a lot more configuration options. All have features like Copy & Paste, Window Resize per Mouse, Splitscreen, Tabs and a lot of other usefull features. Try Clink. It's awesome, especially if you are used to bash keybindings and features. Not the answer you're looking for? Browse other questions tagged terminal cmd or ask your own question. “rm -rf” equivalent for Windows? Why is the Windows cmd.exe limited to 80 characters wide?